Judas Priest debuted new guitarist Richie Faulkner during the season finale of American Idol last week. Priest tore through “Living After Midnight” and “Breakin’ The Law” with former Idol hopeful James Durbin joining Rob Halfordon the mic. Halford told MTV News that Priest decided to do Idol, “Because we've lived so long and done so much stuff in heavy metal and we've seen so many crazy things and heard so many crazy things, when we heard this we went, 'F***! That's incredible, man. Let's do it, you know? This is insane. That's just amazing,'” So as it progressed from 'Another Thing Coming' [performed by Durbin earlier in the season] 'till this point now, when we're on the carpet and we're about to do the show, it's just a dream come true for Priest, for metal and, mostly, for James Durbin!” An estimated 30 million people (!!!!) tuned in to watch the show. Judas Priest will launch the U.S. leg of its final world tour on October 12 in San Antonio. 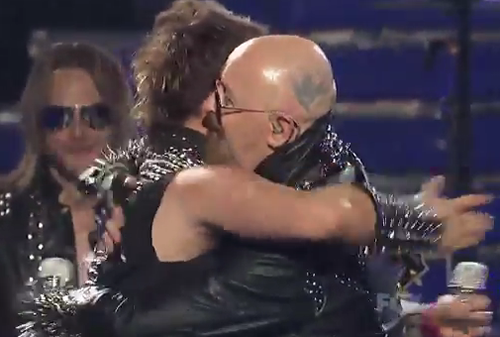 “We're pulling out all the stops,” says Rob Halford. “We've built a brand new stage set, we've got all the effects that people love us for: the lasers, the fire, the bombs, the smoke, new costumes, and the bike. It's just a full-on metal extravaganza.” Check out the dates here.